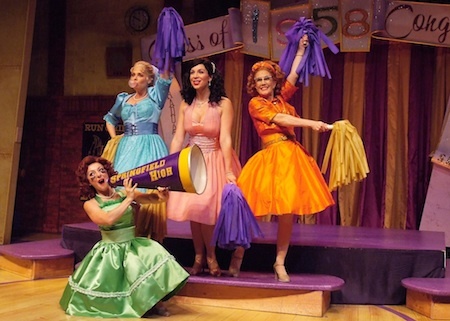 The Marvelous Wonderettes return to Laguna Playhouse in a world premiere with performances through mid August. Anyone who has previously been taken in by “The Marvelous Wonderettes” or “Winter Wonderettes” will undoubtedly find the current production of “The Marvelous Wonderettes: Caps & Gown” at the Laguna Playhouse even more magical. A world premiere, this saga veers into new territory, graduation day from high school and later adulthood for four young women still embracing their inner teenager. “Caps and Gowns” features Cindy Lou (Lowe Taylor) and Betty Jean (Jenna Cooker-Jones), Suzy (Bets Malone) and Missy (Misty Cotton) ready to graduate from Springfield High School in a first act that features music from the 1950s. The second act shows the quartet during a 10-year high school reunion with adult challenges such as dating and marriage, accompanied to music of the ‘60s. Much of the latter is reminiscent of The Supremes and other popular “girl groups” of the day. During both acts, arch rivals Betty Jean and Cindy Lou take teen-witty swipes at each other while Missy, the one with brains and cat-eye glasses, is above it all. Sweet blond Suzy just doesn’t seem to get any of it, including requirements for graduation. Smart or not, they all sing like Broadway stars, especially in the second act when the music veers from ‘50s stuff like “At the Hop” to ‘60s grooves like “Dancing in the Street.” Missy in particular steals the show with “Don’t Mess With Bill,” which translates into don’t mess with me or mine, delivered with hurricane force. Suzy, on the other hand, is the somewhat plaintive, stereotypical “dumb blond” who nonetheless wins everyone over when she announces in the second half that she married her high school sweetheart, is expecting twins and at last has earned her high school diploma. Here, life appears to imitate art or vice versa since Lowe Taylor is reportedly pregnant, but the tall brunet cuts a stunning figure in her crinolined dresses. Kudos to costume designer Bobby Pearce, who caught the flavor of the time with sherbet colored dresses and accessories to match. Audience participation, invited by the cast, further enlivens the evening. Since the four “girls” own the stage, designed to look like a vintage high school gym, they recruit male audience members from the first row as stand-ins for referenced characters such as Mr. Lee, the pined-for teacher and later husband of Missy and the driving force behind “Don’t Mess With Bill.” And then there’s the presumably random selection of audience members, with sometimes amusing age differences between cast and conscripts. 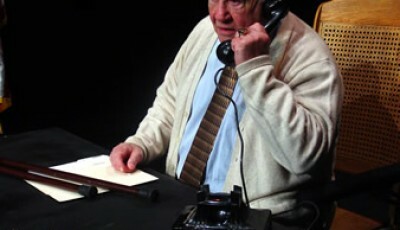 While sets on previous Playhouse productions have been kept somewhat minimal, set designer Michael Carnahan went all out for authentic detail this time. The show’s set, costumes and the addition of a live band [composed of Michael Borth (conducting. keyboard), Eric Heinley (drums), Jack Majdecki(guitar) and Alby Potts (keyboards)] make this the most expensive one in the season, said Playhouse artistic director Ann E. Wareham. She said that she attends part of the performance every evening and admits to identifying with the irrepressible Betty Jean. “To put the investment of the summer show into context, the production and running costs are 85 percent more than the typical production during the season, “ wrote Playhouse executive director Karen Wood via e-mail. She also said that community support appears to be growing due to the election of the theater’s new chairman, Joe F. Hanauer and successful outreach by director of development Elizabeth Pearson.